Electric Cutoff Saw Details - Quasius Equipment, Inc.
Our Huqvarna K3000 Wet electric cutoff saw is an electric powered saw designed to cut concrete and masonry materials. It features a 14" diameter blade, which can cut to a maximum depth of 4.5". Because it's powered by an electric motor it has no carbon monoxide fumes like a gasoline powered saw so it can be used in areas where carbon monoxide poisoning would be a problem. It's also unique in that it's ground breaking DEX Dust Elimination System and double insulated motor allows it to be used for wet cutting as well as dry cutting, which is something that cannot normally be done with an electric saw. The soft start electric motor runs on 120 volts and minimizes startup surges and allows use on a 20 amp circuit. 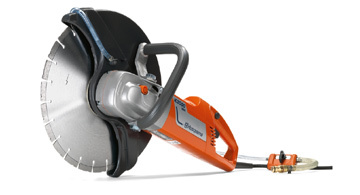 Abrasive blades can be purchased for this saw for cutting either concrete or steel. Diamond blades can also be purchased or rented for concrete cutting. The advantage of the diamond blade is that it's narrower so it cuts faster and produces less dust. It also retains its full diameter, unlike abrasive blades which wear down as they are used, so your depth of cut will be more consistent with a diamond blade. To access the diamond blade data sheet click here. If you need to cut in a basement, you do have other options in addition to this saw. A gas cutoff saw doesn't work in a basement environment unless it's a walk-out basement. The carbon monoxide fumes settle to the floor and by the time they reach a higher window it's too late to prevent asphyxiation. If you use this electric saw, you can use water to hold down the dust. Concrete dust isn't toxic it can get all over and makes for a difficult cleanup task, especially in furnace duct work. For this reason the wet cutting capability with lack of carbon monoxide fumes is a real plus for this application. This is a hand held saw so the cut will only be as straight as you can hold the saw. For neater cuts the walk-behind saw is recommended. Another way to saw in a confined space is to rent one of our pneumatic concrete saws. They are available in walk-behind or hand-held versions and utilize an air compressor which is located outside of the room. Air hose then feeds the saw through an open window. There are no fumes, no electricity, and you can use water to control the dust. They are faster and you can also rent an air hammer at the same time to break the concrete out. The only disadvantage is the higher cost of rental. For info on these options click on the following links to read more about them: Gas Powered Cutoff Saw, Hand-Held Air Saw, Walk-Behind Air Saw. Rate does not include blades.